4 Bedroom Detached House For Sale in Leicester for Asking Price £450,000. This beautifully presented family home offers contemporary living space which is flooded with natural light throughout. The property is spread over two levels and occupies a desirable plot within a quiet residential area in Great Glen. 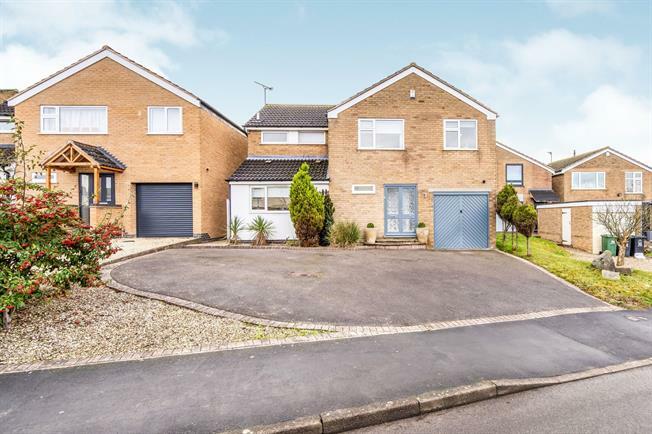 This extended home boasts three reception rooms, kitchen diner, four double bedrooms, en suite bathroom, modern bathroom, ground floor WC and integrated single garage. Some other main features to note include a laid to lawn South facing rear garden, scope to extend to the rear (STPP), double glazed windows and doors, gas central heating with combination boiler, fitted wardrobes and storage throughout, stylish floor coverings, generous driveway parking to front and security alarm. Potential for no onward chain for the right buyer. There are desirable local schools within the village and surrounding area. Convenience shops, public house, lifestyle amenities, countryside walks and places of interest are all within easy reach. Viewing strongly advised.